The next generation of television quality has begun. This also brings new decisions as consumers all over the world upgrade to the latest technology. Plasma and LED are still thriving in the market, but savvy buyers are looking into what the future of picture and connectivity has in store. 4K vs OLED – which is better for you? We covered the differences between Plasma and LED, helping consumers decide which is the best technology for their needs. With this new generation of technology, things are not as clear cut as they were before. Smart TV and polarized 3D were a few new trends introduced in the last generation that enhanced the overall experience. Smart TV borrows many features from any currently available media hub and 3D has been mostly rejected by consumers. These features are becoming economical enough for manufacturers to include in all of their models. The premiums are lowering each year as slimmer profiles and more user friendly software is developed. LG leads the way in Smart TV by creating a simple, colourful interface that rivals most media centers. This discussion topic will be rendered obsolete in a few years once these two technologies merge and lower in retail cost. Right now they’re offered separately to help keep realistic pricing structures in place. With plasma appearing to be near it’s end, the technology in TV’s could be reduced to only OLED. The current 4K displays are still LED, which brings along the troubles they’ve faced since the beginning. Motion blurring, washed out black levels and over saturation are the biggest downsides to LED panels. Each of these new technologies are equally important and offer different benefits. 4K is a new resolution, measured in at 4096×2160. This is a little bigger than 4x the resolution of 1080p. I have the Samsung 28″ 4K monitor, and it has a native display size of 3940×2160. As shown in the photos, the display allows you to fit 4 1080p windows on the screen at once. This resolution difference can be compared to taking a small digital image and printing it on a large scale. The photo will end up blurry and pixelated. The same concept applies for TV screens. If you have older lower definition content and try to stretch it on a 4K display, it will appear distorted. 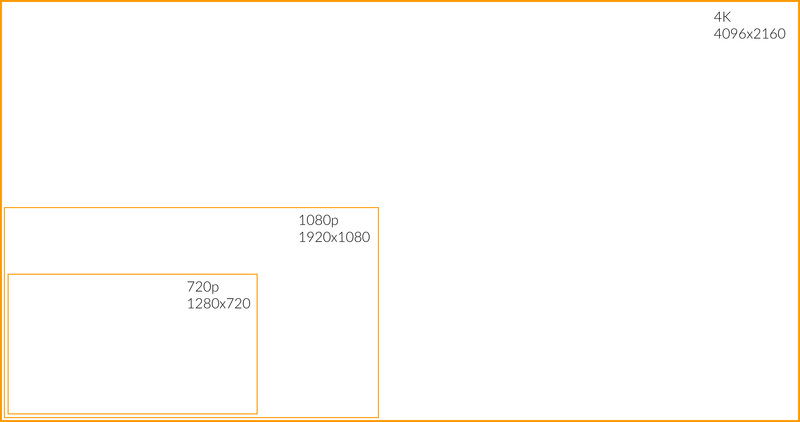 Higher resolution content is required as the standard size for TV’s is now 60″. In 3-5 years that standard could be 70″ and continuously grow from there. This image represents the scale of difference between resolutions. Blu-ray movies have a native resolution of 1080p. Cable TV from Rogers and Bell are only broadcast in 720p. Very few sources are currently recorded in 4K. Having images natively displayed in 4K resolution will show an entirely new level of quality, even greater than the jump from standard definition to high definition. The only disadvantage is that a TV with a screen size greater than 60″ is required to take full advantage of the quality. Screens less than 60″ will have very limited benefit. OLED is a brand new type of technology. It stands for Organic Light Emitting Diode. Based off the LED platform, it brings plenty of enhancements. OLED does not require a backlight which will lead to paper thin, flexible displays. This won’t be utilized for TV’s but more for mobile devices in the near future. The colour saturation and contrast ratio is a large enhancement over it’s predecessor, giving OLED an image more vibrant and colourful than anything ever seen before it. OLED is currently limited to 1080p until manufacturing costs can be reduced. LG has unveiled a 77″ 4K OLED panel, but it’s not on the market yet. Prices for these models are still ranging between $15,000-$25,000. Until they’re under $5,000 for a 70″, and under $2,000 for a 60″, they won’t be able to reach mass market. The refresh rate on OLED has been said to rival Plasma technology but is still unconfirmed. If OLED is able to fix the downsides brought by LED, it could become the perfect television. The price of 4K models are lowering faster than OLED, so if you’re trying to stay cost conscious then it could be a better option. However, most content is produced natively in 1080p, so current OLED TV models will continue to have a long lifespan before they become outdated. In conclusion, 4K provides sharp, high resolution picture quality at 60″ and up. OLED displays a precisely detailed image, with colour saturation and contrast levels unlike anything currently available. If you’ve purchased either of these two new technologies, let us know what you think.